But years before the gold plates were discovered Joseph Smith used that same seer stone to find buried treasure for people who paid him for the service. In 1826 Joseph was brought before a justice to answer the charge that he was an imposter and was bilking people out of their money. (see Marquardt and Walters, Inventing Mormonism, pages 63-77) During the court proceedings Josiah Stowell, a man who had employed Joseph to find buried treasure, gave testimony. Mr. Stowell’s gullibility and circular reasoning is easy to see in his testimony. When I read it, it made me laugh. But the fact that many Mormons use this same sort of circular reasoning in determining spiritual truth is no laughing matter. Joseph Smith’s teachings were divinely inspired; therefore, he was a prophet of God. And because he was a prophet of God, we know his teachings were divinely inspired. Does this sound a bit like Josiah Stowell? I get dizzy thinking about it. If you are a praying person, please pray with me for all those lost in “spiritual” circular reasoning, that God would grant them eyes to see and a reasoning mind to understand. This entry was posted in Book of Mormon, Joseph Smith, Mormon History. Bookmark the permalink. Joseph Smith said, No man can see God and live without the priesthood. Hrm, cool point Rick. Great Post, Thanks!!! Circular reasoning works the other way too. Mormon- But how do you know the Book of Mormon is false? Well meaning, but illogical Christian- Because it was produced by a false prophet. This is an example of “Begging the question” or as Sharon has already labeled it, circular reasoning. Although the well meaning Christian is correct in saying that Smith was a false prophet and that the BoM is false, the reasoning he used to come to that conclusion is faulty. You can read more about this logical fallacy here. 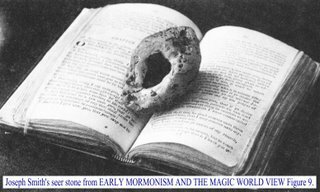 I think this post demonstrates that Joseph Smith was a false prophet by highlighting some of the questionable activity he participated in and how he suckered people into believing him. So I don’t think the argument is circular. Do not talk rationalisation and reasoning with Mormons. Mormons are incapcitated by their religion to search for the truth.